After 36 hours of more or less constant rain – there were a few pauses of a minute or two – we were getting a little stir-crazy and finally awoke to a morning dry enough to pack up. Everything was still very wet but it wasn’t actually raining on us. Still, things could have been a lot worse and, indeed, in the Vars region (southern Provence) they were worse; the poor folks there had suffered fatal flash flooding. 11 days on one campsite is our record and we’d just equalled it. It was definitely time to move. Many years ago I headed for a place in Germany called Titisee, for no more reason than I felt the need to visit a place with such a name. It was in the Black Forest and, as long as you avoided Titisee Neustadt (Neustadt = Newtown), it turned out to be very pleasant. For much the same reason, I’ve always had a hankering to visit Condom in France. We’d found four campsites, a municipal and three farm sites, listed under Condom and sallied forth. Let’s get the joke out of the way now. After 5 hours of towing along side roads, I arrived in Condom. Wow, the boy certainly knows how to make an entrance! OK, done, back to reality. 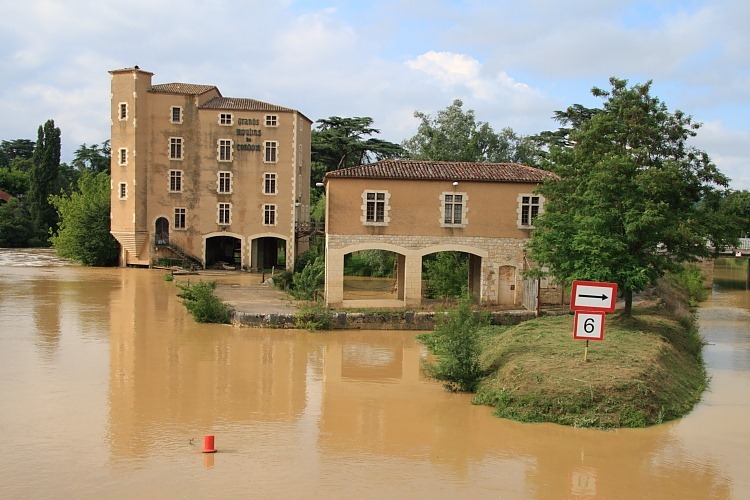 Reality was that, following the lengthy period of rain suffered by much of southern France during the last week, the river Baïse flowing through Cognac looked more like chocolate or coffee than water. I’m sure that this isn’t its normal colour. We drove first to the municipal site which, for a one night stop, would normally be fine. We found it without trouble but, immediately opposite the entrance gate was another large camping area – the largest encampment of gens de voyage (itinerants) we’ve ever seen. Itinerants may not actually be a problem but such a large gathering (there were at least 50 vans) doesn’t give one the greatest feelings of relaxation and security. The municipal site is probably fine and did have security barriers but we did a quick three-point-turn with the caravan still attached and headed for the nearest of the farm sites thinking that we could do better. The farm site was very, well, rustic. Let’s face it, it was pretty darn shoddy and everything looked like a complete lash-up, particularly the single electricity connection box. We stopped and had a good look around but did another U-turn with hearts beginning to sink. It wouldn’t be the first time we’d wanted to visit somewhere but had had trouble finding a suitable campsite. We headed for the next farm site on the list. What a difference! This site was a much neater and better arranged affair. This farmer had actually put some effort into a couple of fields, one shaded and one not, amongst his main fields growing vines for Floc de Gascogne. The farmer, a particularly jolly individual, greeted us with a handshake and began showing us around. He asked if we liked Floc de Gascogne and I somewhat sheepishly had to admit that we’d never actually tasted it. That would never do; he wandered off to fetch a key with which he opened a door into what looked like a bar area (on a farm?) complete with fridge. He rummaged in the fridge and extracted two bottles, one of white Floc de Gascogne and one of red Floc de Gascogne. A dégustation (sampling, tasting) ensued for our benefit accompanied by his commentary. Floc de Gascogne is the Gascony equivalent of Pineau des Charentes, a dessert concoction made from a combination of wine and brandy, the brandy supposedly distilled from wine of the same source grapes. After a 185 mile drive and a slightly fraught search for an acceptable campsite, it was very relaxing, convivial experience. How could one have a warmer welcome?